A state of emergency has been declared this Saturday by Ecuador’s president, Rafael Correa. The measure was taken as a precaution given the recent increase in volcanic activity of the Cotopaxi stratovolcano, allowing the government greater freedom to allocate financial resources and critical personnel in the event of an eruption. Cotopaxi rises just 43.5 miles south from the capital, Quito, and the ruling body of the country has already taken steps to protect its people. Two minor explosions on Friday have prompted authorities to perform a precautionary evacuation of the small towns in the middle of the country, where the effects would be most devastating. 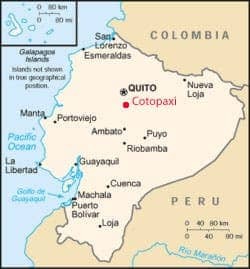 Cotopaxi’s central position in Ecuador would make an eruption extremely devastating for the South American country. The state of emergency gives the government the authority to mobilize security forces all throughout the country and to block publication of information regarding the volcano. It can only do so for 60 days, the maximum length of the state of emergency. “We declare a state of emergency due to the unusual activity of Mount Cotopaxi,” Correa said during his weekly Saturday address. “God willing, everything will go well and the volcano will not erupt,” he added. He went on to say that about 400 people have been voluntarily relocated to shelters after the explosions and expulsion of ash surprised nearby residents on Friday. As a further precaution, The Environment Ministry closed down the Cotopaxi National Park until the volcano simmers down, as Cotopaxi is one of the world’s highest active volcanoes and is popular with tourists. The last eruption of the mount took place in 1940, according to the Smithsonian Institution’s Global Volcanism Program.